Carrie Monteith, daughter of Andrew Monteith and Myrtle Belle Cleveland, was born Jan. 22, 1903 in Dickey Co., North Dakota and died Mar. 15, 2001 in Creston, Union Co., Iowa. 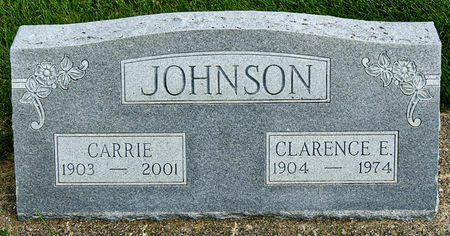 She married Clarence Edward Johnson Oct. 8, 1925 at Aberdeen, Brown Co., South Dakota. He was born Nov. 28, 1904 in Ringgold Co., Iowa, son of Nelson Johnson and Minnie Larson, and died Feb. 25, 1974 in Kent, Union Co., Iowa. Searching for CARRIE MONTEITH JOHNSON in Taylor County Iowa?